One of comics’ greatest creators returns to the page with an all-new team of heroines. 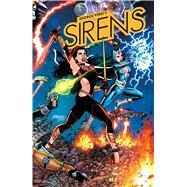 As an intergalactic force enslaves planets across the galaxy, the legendary team known only as the Sirens must reunite to save the galaxy—but is that even possible when the Sirens themselves don’t remember who they are? And the rest of the universe only remembers them as…villains? Legendary creator George Pérez, best known for his incredible work on Wonder Woman and The New Teen Titans, writes and illustrates this graphic novel, featuring his next great superteam. George Pérez started drawing at the age of five and hasn't stopped since. Born on June 9, 1954, Pérez began his professional comics career as an assistant to Rich Buckler in 1973. After establishing himself as a penciller at Marvel Comics, Pérez came to DC in 1980, bringing his highly detailed art style to such titles as JUSTICE LEAGUE OF AMERICA and FIRESTORM. After co-creating THE NEW TEEN TITANS in 1980, Pérez and writer Marv Wolfman reunited for the landmark miniseries CRISIS ON INFINITE EARTHS in 1985. In the aftermath of that universe-smashing event, Pérez revitalized WONDER WOMAN as the series' writer and artist, reestablishing her as one of DC's preeminent characters and bringing in some of the best sales the title has ever experienced. He has since gone on to illustrate celebrated runs on Marvel's The Avengers, CrossGen's Solus and DC's THE BRAVE AND THE BOLD.